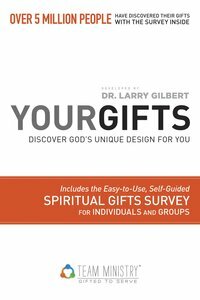 :An indispensable companion to the Your Gifts Spiritual Gifts Survey, this book takes an in-depth look at each of the nine team gifts. Perfect for use in small groups, this dynamic new book reveals steps to nurture and activate your gift in practical ways. You will learn about the potential roadblocks that can inhibit your gift, as well as pitfalls to avoid going forward. God created you with purpose and passion?learn how you can take the gifts He has given you and use them to advance His Kingdom in ways you never imagined. It's time to go deeper?it is time to discover how God uniquely designed and gifted you, and become the person He created you to be. Includes: 192-page paperback including the Your Gifts Spiritual Gifts Survey so readers can discover their spiritual gifts as they learn how to use them more effectively. About "Discover God's Unique Design For You (Your Gifts Series)"
Gilbert is founder and chairman of Ephesians Four Ministries, parent organization of Church Growth Institute. 2. What Is A Spiritual Gift? spiritual gifts; we must put them into practice in daily living and service for God. Therefore, at the close of every chapter you will find a section titled Next Steps. using your spiritual gifts for His purpose and glory. tools for activating your gifts for greatest impact. Excerpted from the introduction "How to Use This Book," pp. 7-8, YOUR GIFTS: Discover God's Unique Design for You, by Larry Gilbert. Copyright 2015 ChurchGrowth.org. Order now to secure your copy when our stock arrives. Other edition is available. 9781570523281 0 Available. Expected to ship in 6 to 7 weeks from Australia.